From buttery soft to bold tanginess, choose your favourite from our handcrafted semi-soft, semi-firm and firm cheeses. Need a soft cheese for cooking? Make it sweet, buttery Amsterdammer. Looking for bolder flavours for an omelette? 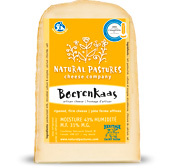 You’ll be happy you tried our Boerenkaas. Want to show off unique, Vancouver Island foods on your cheese plate? Our Courtenay Cheddar and Smoked Boerenkaas are sure to impress. A favourite with Comox Valley locals with a creamy, buttery aroma and mellow infusion of field herbs. A perfect cheese for cooking, melting and sandwiches. The ‘terroir’ is the sense of place of a cheese or a wine that is conveyed by the distinctive flavours of its geographical location and the environment in which it is ‘grown.’ Salty ocean air, melting glaciers that feed the rivers, fog and rain that generously quench the meadows and the forests: our Courtenay Cheddar embodies the essence of the lush Comox Valley. The ‘terroir’ is the sense of place of a cheese or a wine that is conveyed by the distinctive flavours of its geographical location and the environment in which it is ‘grown.’ Salty ocean air. Melting glaciers that feed the rivers. Fog and rain that generously quench the meadows and the forests. And cows that graze on grass and herbs in the meadows surrounded by diverse ecosystems. 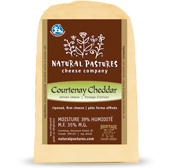 Our Courtenay Cheddar embodies the essence of the lush Comox Valley. 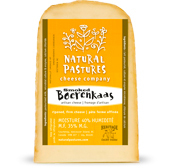 Dutch for ‘Farmer’s Cheese,’ award-winning Boerenkaas has a sweet nutty flavour and bold, tangy finish. Superb in soups, salads, omelettes and pizzas. National Champion Boerenkaas is naturally smoked at our facility using local hardwoods. A superb West Coast experience on multiple levels. Many smoked cheeses are not actually smoked; instead, smoke particulates are added to the cheese to give it a smoky flavour. But, when we decided to smoke our crowd-pleasing favourite, Boerenkaas, we knew we had to do it right and that, of course, meant doing it the ‘Natural’ way. So we partnered with another Island favourite, Smoken Bones Cookshack, collected some local hardwood, and got to work. 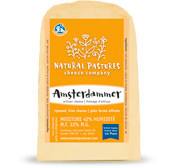 According to the judges at the 2011 Canadian Cheese Grand Prix, our ‘Natural’ way was just right.